As a writer for The Liberty Beacon and as a documentary producer working on SPOTTING THE TRUTH I am seeking four types of interviews with students that attend Syracuse University. The university is supposedly being hit with a mumps outbreak that led to the endorsement of a 3rd MMR booster shot for all students and allowed the university to bar students using religious and medical exemptions to avoid vaccination. Syracuse University claimed that by promoting a 3rd MMR the number of cases would go down, but this simply has proven to be untrue. As of Tuesday Dec 5, 2017 SU’s number of confirmed cases rose to 51, with at least 81 probable cases on campus. For those who don’t understand in epidemiological terms a “probable case” of an illness is one that meets clinical case definition and has supportive or presumptive laboratory results that are consistent with the diagnosis, yet does not meet the criteria for laboratory confirmation. It is medical double speak that can be used to make it seem as if there are less or more of an illness depending on what agenda they are trying to push. Having heard the position of Syracuse University regarding the outbreak, it is important to hear from SU students who have actually been impacted by the mumps outbreak. Those who come forward for interviews will be opening the doors for important discussions about vaccine safety and the right a person has to their own body. 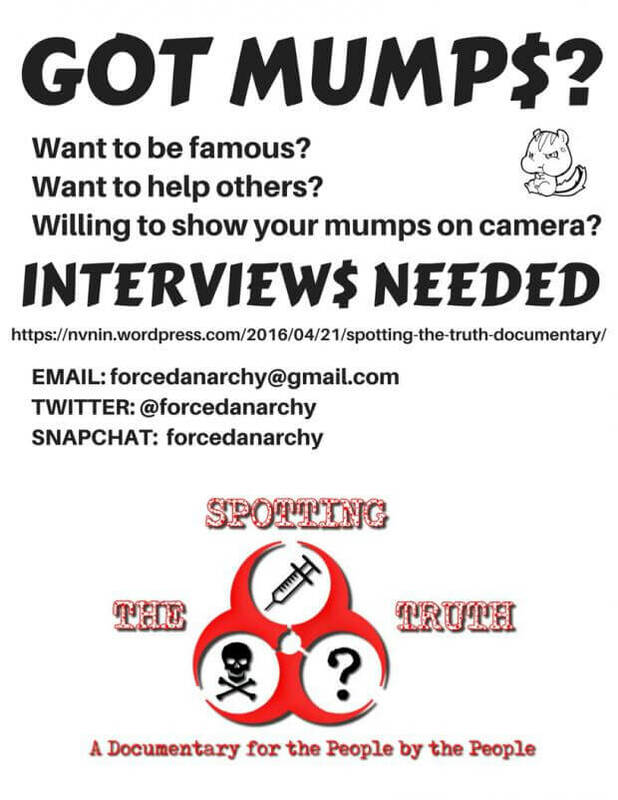 The first type of interview is with students who have the mumps. I think that it is important to show what the mumps are really like and to learn the vaccination status of those impacted by the childhood illness. Students who have recently been ill are also welcome to share their experiences. The second type of interview I am seeking is an interview with students who were booted from campus for using their right to a religions or medical exemption. The booting of un-vaccinated students had nothing to do with public health and these students were treated unfairly. It would be instructive to hear their side of the story. The third type of interview is with students who got the 3rd MMR. What was your motivation behind it? Were you told of possible adverse reactions? Were you pressured into the vaccine? Did you have a reaction from the vaccine? These might seem like silly questions, but these are important things to know and think about. Many people who have adverse reactions to vaccines do not make the association until years later. The fourth type of interview is with anyone who can prove there is an actual outbreak. 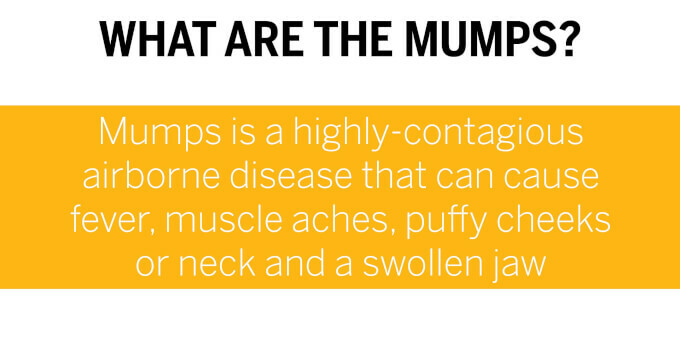 I have spoken with many students and no one seems to actually know anyone with the mumps. Very few students are talking about it on social media and the outbreak seems to be magically contained to the university. As crazy as it sounds I am left wondering could this entire outbreak be a false flag event? Could the numbers of mumps cases be vastly exaggerated to push a 3rd dose of the MMR? The public has a right to know what is really going on. Take a look at the following article from the Daily Orange. If ever there was a pro vaccine propaganda article, or fake news, this is it! I urge everyone to look at Jordan Muller’s reporting and understand that this is not reporting but rather a regurgitation of half truths meant to promote fear. I too understand that the Daily Orange is the official paper of SU, but the lack of critical thought from a journalist in the making is unacceptable. Bring on the interviews with students who have the mumps and with those who have been removed from school for exercising their religious / medical rights to vaccine exemptions. Syracuse University, which has had 45 confirmed and 81 probable cases of the mumps since the end of August, is not the only college that’s grappled with an outbreak of the disease in recent years. A mumps outbreak at the University of Missouri infected nearly 400 students in a 10-month span after the university confirmed a student contracted the disease in August 2016. By the time a mumps outbreak at the University of Illinois ended in June 2016, 317 students had been infected. And 301 students caught the mumps during an outbreak at the University of Iowa between July 2015 and May 2016. SU health services officials say the disease is not spreading on campus as quickly as before. But, as the number of mumps infections spike nationwide, SU is one of the latest in a growing number of universities forced to handle the highly contagious disease on campus. According to the Centers for Disease Control and Prevention, 4,980 people contracted the mumps nationwide between Jan. 1 and Nov. 4 this year. In 2016, more than 6,000 cases of the disease were reported, up from about 1,500 cases in 2015. 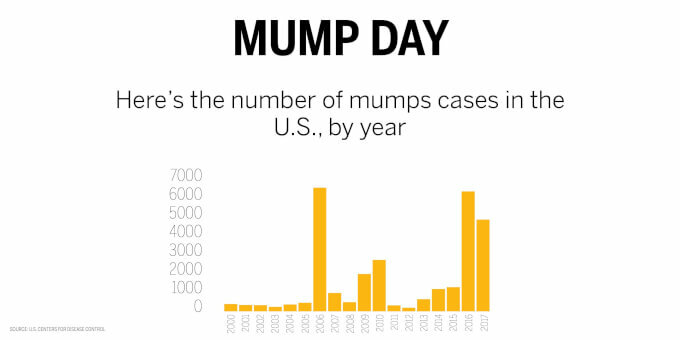 There were less than 500 cases of mumps nationwide in 2012. Mumps cases reported to the CDC in 2016 and 2017 have primarily been “associated with college settings,” according to the agency. Brittany Kmush, an assistant professor in the David B. Falk College of Sport and Human Dynamics who studies infectious diseases, said mumps can spread quickly on a college campus because students are interacting in close quarters, such as living together in dorms and coming in contact with each other in classrooms. But scientists are not sure why the disease has been contracted in such high numbers in recent years. Moore said researchers believe the mumps vaccine’s effectiveness may wane as people get older. That may be one of the reasons why the disease has made a comeback in recent years, she added. To attend college in New York state, students are required to receive two doses of the measles, mumps and rubella vaccine. Most are vaccinated when they are children. Since the end of October, SU has hosted seven clinics so students could receive a third dose of the MMR vaccine. Every SU student who has contracted the mumps has been properly vaccinated, though, according to the health services website. Although a CDC advisory board in October unanimously recommended that people exposed to a mumps outbreak should receive a third vaccine, federal officials also said there was limited scientific evidence showing whether the third dose protected individuals against mumps-related complications, The Washington Post reported. But is a third vaccine effective? Quinlisk said the effectiveness of the third MMR vaccine depends on the timing of mumps cases, who the cases are occurring in and whether cases are linked. A third vaccine is effective, Quinlisk said, if there are multiple mumps cases in a single dorm during a short period of time. If there are isolated cases over a longer period of time, a third vaccine isn’t necessary, she added. 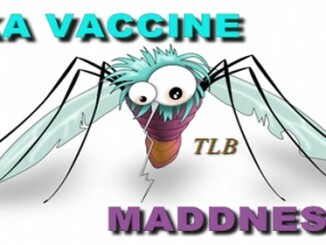 Brad Hutton, deputy commissioner of public health at the New York State Department of Health, said at a press conference in October that the third vaccine will not stop the mumps from infecting those who have already been exposed to the disease. Still, roughly 30 percent of SU students received a third MMR vaccine through the university’s clinics, said Karen Nardella, medical director of Health Services. Ben Domingo, director of SU Health Services, said the university has handled the mumps before. None of the previous cases were considered an outbreak, he said. But, he added, those cases helped the university plan how it would confront a larger mumps outbreak. Nardella said SU officials also looked at how the State University of New York New Paltz and University of Missouri handled mumps outbreaks. SU’s response to the outbreak has included isolating students with confirmed or probable mumps cases from the rest of the campus community for up to five days. “The minute we were getting cases we were already familiar with the fact that, this fall, isolation was necessary,” Domingo said. Students have been housed in South Campus apartments and the Sheraton Syracuse University Hotel & Conference Center. If a potentially infected student lives in university housing with their own bedroom and bathroom, such as on South Campus, they can spend their isolation there, Nardella said. But because some may have roommates, they are asked to wear a mask in the rooms’ common areas. Students can also spend their isolation at home, if they can drive themselves, or their family can pick them up, Nardella added. The university will check on students periodically while they are in isolation, she said. Students are also delivered food. 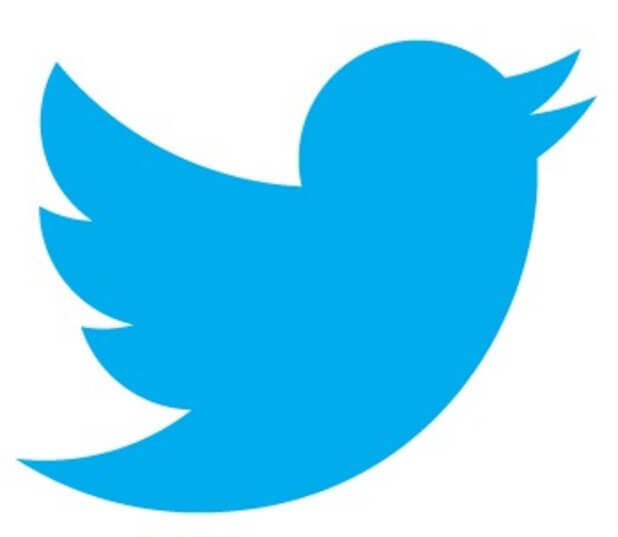 After five days in isolation, the student will be allowed to return to campus. The Onondaga County Health Department in late September ordered SU to “exclude” students from campus who had not submitted vaccination records. Currently, four students remain excluded from campus, Nardella said. Students can waive New York state’s MMR vaccination requirement for medical or religious reasons. If a person has a suppressed immune system or is taking certain medications, that could qualify as a medical exemption, Nardella said. The four students excluded from campus will not be allowed to return to SU until at least Dec. 14. According to Health Services, they must remain off campus for a minimum of 26 days after the most recent confirmed mumps case. If a new mumps case is confirmed, the 26-day exclusion period starts over. Dolan Evanovich, senior vice president for enrollment and the student experience, said faculty members have made accommodations with those four students so that they can finish the semester. Students have been able to complete coursework online, Evanovich said, and faculty have been following up with students individually. There have not been discussions about refunding tuition for the students who, by Dec. 14, will have been excluded from campus for more than two months, he said. Nardella said the spread of mumps at SU began to slow in mid-November, which she attributes to the vaccine clinics and communications from the university about how to prevent the transmission of the disease. In mid-November, only two students were in isolation, she said. Zika Virus: Pharma’s New Cash Cow!